Are you a fan of stuffing? When the holidays come, do you picture yourself sitting at the table, scooping out a mound onto your plate? Like ever. When that bowl gets passed around the table, it goes right by me. Just the idea of stuffing a bunch of stuff into a space simply because it’s empty, doesn’t really appeal to me too much. Yuck, as a matter of fact! Which is why this morning, I found myself laughing as I stood at the abyss of the toy room doorway. Granted, balls, games, books, racetracks, stuffed animals, magic kits, coloring books, and musical instruments aren’t technically the same as bread crumbs, raisins, and apples, but the idea is somewhat similar. Hey, this is empty- let’s put it here! Each time I set foot across that door’s threshold, I turn around, scrambling for the nearest exit. Whew, made it out of there! So, I knew I was going to have to come up with a plan for actually getting something done in there. Enter Bee Organized With Pamela. 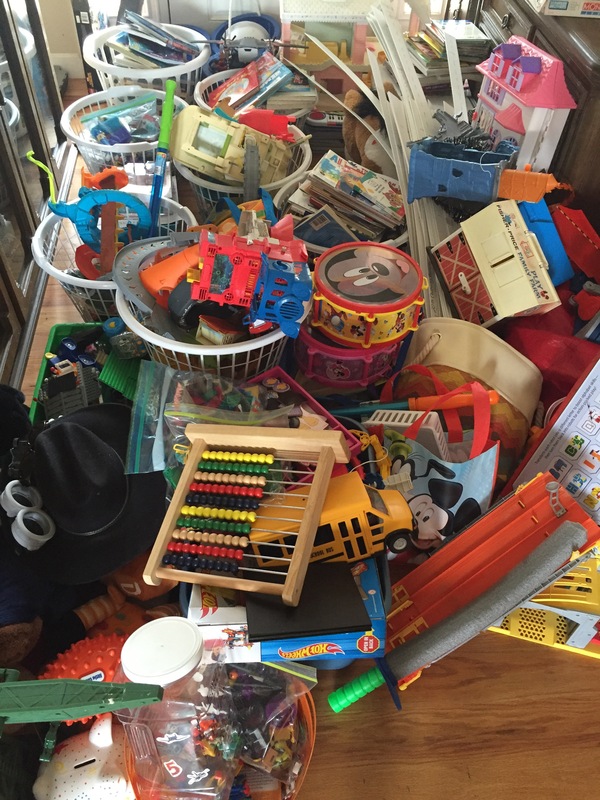 You want to talk about some tips for taming clutter? She’s got amazing ideas. A few days ago she had a post asking if we wanted to park in our garages this year. I can’t remember the last time I could. When I commented, I mentioned the toy room, and she gave me some fabulous tips. I was all fired up. Well, despite my “good” intentions, I didn’t get anything done in there that day. At all. But, for some crazy reason this morning, I had on my imaginary “I can do this” boots. And, I just have to say, I rocked that room! I got everything moved out! Afterwards, I texted my mom. Her response? Next on my To-Do List? Hi Miri. Ha! Yes! From one room to another sums it up quite well! You are SO right! It’s never an easy task. Seems easier to just close the door… I was laughing while writing my post. Always up for a good laugh! :) Yes, Pamela is awesome! So nice, too. Well cool! You can have my share of the edible kind. Ha! And, I love the imagery of wading through a sea of stuff. Darn. I wish I could draw comics. That would be a hilarious subject matter. Ha ha. Well your talent is in writing humorous stories. No matchstick men needed with the pictures your words draw! Such an upbeat, well written post! 😄 Hope you find a solution for the foyer soon!! Thanks! Needed some laughs! My mom knew that the toy room was brimming with piles! I laughed out loud when I reread this post last night after I wrote it! Isn’t it kind of funny how easy it is to walk around a cluttered up room forever, but when the thought of someone else even catching a glimpse of it, whips cleaning it into high gear? Your mum sounds lovely. If she’s anything like mine, she’ll probably guess that the whole house was turned upside down in anticipation of her visit. I always used to clean like crazy before she and dad arrived. Now I only deal with messiest places. Guess I better find out when they’re coming to visit so they’ll be able to get through the front door! Ha ha ha! Oh good!! Moral support! Ha! Our utility room is full of all kinds of stuff. It’s so overwhelming, I just avoid it like the plague! Ha!! Good luck on the foyer! Yikes!! Ha ha! Yesterday I tried to go in that door from the outside twice. That’s pretty much a no-go! My mom always had a “junk drawer” …. for some reason I seem to “junk areas”. On the note of stuffing….my husband despises bread stuffing but was raised on rice stuffing. I must confess I like them both equally. I sure can! It is one that my husband’s family has always used at Thanksgiving. Maybe will have to do a Pre-Thanksgiving post :). Ha ha! You made me burst out laughing! The more space you get, the more clutter you gather. That’s basic nature of we girls. I have about 100 pairs of colored earings, Bangles, necklaces, all cluttered in one drawer. Another filled with hair accesories, another with holy things. I wonder when I’m going to clean them and sort them out. I would have screamed the roof off, if I had seen that clutter of stuff, you have there. Hi there. Welcome. Love what you said. There may be a big lesson in it for me- more space= more clutter. Good luck with all your drawers. Sometimes I wonder if clutter was invented for a reason. In a world full of things we can’t control, we CAN choose what to do about cluttered rooms and when. Thanks for your insight! PS screaming the roof off is understandable! I quietly did the same! Ha! Hi there! Oh my gosh! You made me laugh! Glad I’m not the only “I’ll just put all this stuff HERE instead” type gal! I told Pamela I wish she could be here for FIVE MINUTES! A life raft in a sea of stuff… Ha! Ahhh. The bathroom. What fun! I’ve never understood why cleaning toilets became MY duty around here! We girls must be great at it I guess. I know exactly what you mean about the Tupperware lids and socks! I always joke that our house swallows things. Like game pieces and pens! Seriously? Where do they go? I told my husband last week that I bet if we could pick this house up, there’d be a pile of missing goodies under it! While you were sparkling up your bathrooms, I CLEANED the foyer!!!! Of course, some of it is now cluttering up the dining room… But I’m am working on getting things back in their places! Ha! Ooooo I’m impressed! We can be a pair of ‘sado’s’ together!!! It’s a good job my toilet can’t talk – I suspect it wouldn’t have been quite so polite as yours! haha..
Yep – where do they go.. Although – my husband (many moons ago – he daren’t now haha!) once threw a hissy fit because he said there wasn’t ‘one pair of socks in the drawer’…. When I went through the drawer I paired up over 50 pairs of socks!!! (although there were still some odd stragglers lurking..) – He never dared say that again!! Now you see – you continued to ‘labour’ while I sat down with a cuppa so now I feel guilty but well done you for continuing your quest! Oops. Got that backwards. Well, here’s to Miriam for crossing our paths! 🎉 She’s amazing. Soooooo kind! No guilt allowed! Ha! Especially when it comes to cleaning. It’ll still be there later!! L a u g h i n g SO hard. Sock monster in the making! Thank YOU! I just crawled out of cleaning a stuffed to the brim closet. At one point, I opened up a pillowcase stuffed full of something. I peeked in there. HI!!! Oh how I’ve missed you!! :) No wonder we get along sooooooooo well. Junk queens! My drawers are overflowing and don’t even think about opening the hall closet!! Ha! The foyer is fixed! 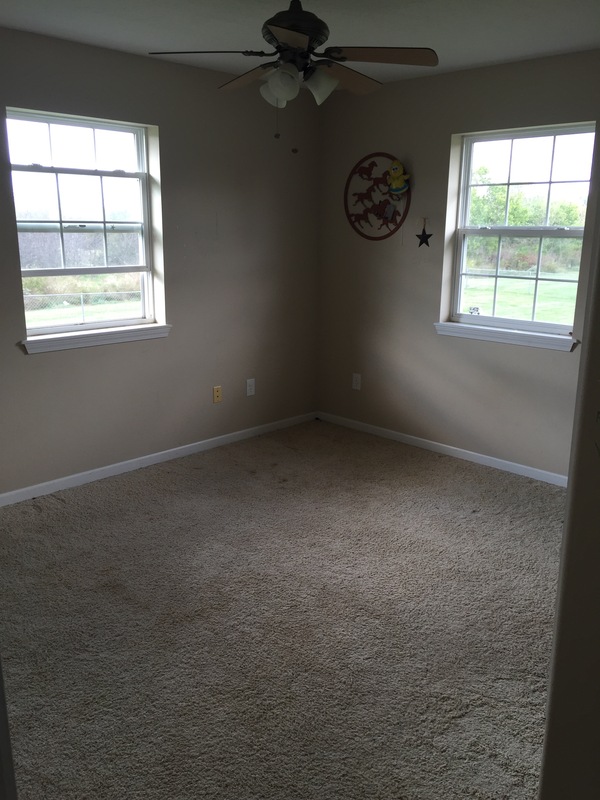 The toy room was transformed into a bedroom, and the dining room???? Too funny. Hey Little Bit has some great toys! After my mom’s passing and going thru her treasurers and stuff, it made me go thru some of my things. It’s good to declutter – or at least move it to another room! PS I can get BOTH of my cars in my garage!